Nick Cutts is a musician based in Derbyshire, UK playing bassoon, guitar and piano. Nick began his musical career as an Orchestra Manager, working as ‘Fixer’, Librarian, Concert and Stage Manager. He left the orchestral life in 2000 to establish OPUS Music CIC (OPUS), a not-for-profit organisation dedicated to providing music-making opportunities for people of all ages across the midlands region. OPUS has a strong history of supporting music-making with children and young people, its ‘OPUS Ensemble’ programme working in partnership with many schools to develop group music-making approaches. OPUS is renowned for the high quality of its early years music-making and music in health projects. Nick trained with Musique & Santé in Paris, Dublin, Krakow and Manchester as part of two European funded projects, exploring the competencies required of musicians in healthcare settings and developing techniques and skills in delivering training to musicians and healthcare professionals. As a Director, Musician and Lead Trainer for OPUS, Nick has delivered music residencies in Royal Derby, Derbyshire Children’s, Nottingham Children’s, Leicester Children’, Kings Mill and Sheffield Teaching Hospitals. 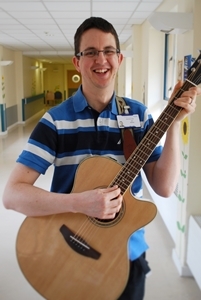 He has delivered highly acclaimed training programmes in partnership with MusicLeader, Youth Music and other partners for musicians wishing to work in healthcare settings, alongside programmes for healthcare staff. Future plans for Nick and OPUS are to continue existing residencies, alongside plans to deliver training to musicians and healthcare staff across the region, in Brighton and Dublin.